In retrospect, 2007 was a very interesting year. We saw the introduction of the first iPhone, the demise of the domestic housing market, and U.S. equities established all-time highs. Turning the calendar ahead to today, the iPhone continues to drive our imaginations and the housing market has made a remarkable bounceback. 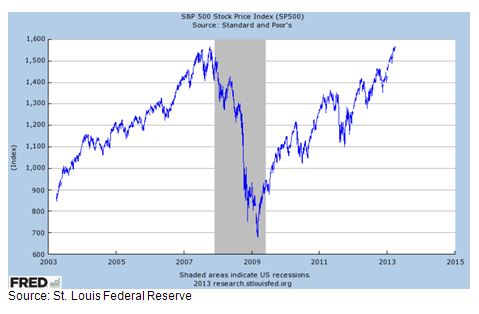 More importantly, just last week, as shown in the chart below, U.S. equities, as measured by the S&P 500, finally exceeded their 2007 peak. Stock market strength has been primarily driven by corporate earnings reaching new highs. Slow growth in the U.S. economy. The consensus among economists is that the U.S. economy will grow, best case scenario, in the 2% to 2.5% for 2013. While the stock market can rise despite slow growth â€” as it did in 2012 â€” the U.S. economy faces a number of headwinds that could impinge on stock market performance later this year. These include the delayed effect of the payroll tax hike and continued fiscal restraint beyond that provided for in the sequestration. A recession in Europe. Growth has all but halted in Europe, and the recent controversy about the resolution of Cyprus's banking problems served as a reminder that the region still has a ways to go in reducing its debt burdens and finding a path to sustainable growth. A real estate bubble in China. The Chinese government has stated that it intends to take action to cool off an overheated real estate market; some are concerned that the bubble may have already burst. An end to quantitative easing. Large-scale purchases of bonds by the Federal Reserve have been providing a great deal of liquidity to the markets that, to all appearances, has succeeded in inducing investors to take on more risk. This has helped boost both equities and the prices of credit-sensitive bonds. While the economy appears far from achieving the reduction in the unemployment rate to the 6.5% that the Fed has indicated would allow a move to a less expansionary stance, a more-rapid-than-expected improvement in the economy, and hence earlier end to quantitative easing, cannot be ruled out. With equity markets likely to face these headwinds and gyrate accordingly, we remain steadfast in our recommendations. While we continue to suggest equity allocations in-line with investment objectives, within equities we are biased toward domestic equities and larger capitalization companies. Throughout the portfolios, we continue to stress income via dividends or spread product (non-U.S. Treasury fixed income) and increased diversification.